These are the targets of Transmission #01. Then let’s have a look..!. Was the second target from the left in one of the old James Bond movies? No 2nd from left is Arecibo Puerto Rico. Not Ernst Blofeld’s secret SPECTRE rocket base embedded in a dormant volcano. 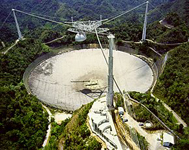 Actually Arecibo was in Golden Eye (1995). However, I am intrigued. What is TRANSMISSION #01? I am familiar with Jerry Ehman’s (SETI) WOW! seemingly intelligent signal from Sagittarius Constellation in 1977. Did you know the Ukraine’s responded to the Sagittarian signal? 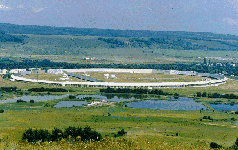 There was one other received quasi-intelligent signal by SETI but they are not sharing right now. If your doing DECODING please make sure you understand that the Hydrogen Line is about as far as they get intelligent. Nothing else. The Sagittarian signal was sent in late 1700’s AD as it takes that long for light to travel that far. Some of the spurious signals are actually from Russian or American DoD spy satellites and might be confused with 1st contact. SETI has received many of those and has rejected them. If all you are doing is depicting deep space listening systems you have left out a BIGGIE. Need to look at the VLBA site at Plains of San Agustin fifty miles west of Socorro, New Mexico. But the VLBA is actually 5,000 miles across from Hawaii to Virgin Islands. Oops I get it now… I accidently stumbled into a HaD contest. Oh well… From what I see so far many of you must be very young and don’t remember or are not familiar with 1969. From what I see on the surface this has to do with something that started in 1969 and stretched into 1990’s. A man named David Robert Jones from UK played a key role in this sci-fi-esque project or should I say space oddity?. This appears to be a very cool contest… just don’t expend too many brain cells. I don’t think it will be that hard to figure out now… Maybe I’m wrong. The fourth picture is 24-bin colour format, yet if you zoom into it, it looks kind of odd. It’s the NRAO Green Bank Telescope, then Arecibo, then LOFAR (Low Frequency Array), then I’m not sure about the next to last, then the last is Effelsberg. 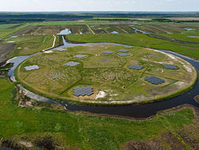 All Radio Telescopes. Most are in some way connected to SETI. I take back what I said, because I’m starting to think that this is to see how well we can decrypt signals. That 4th picture looks like some of the bits in it are encoded to carry a message. I’m kinda’ thinking folks this all has to do with a legendary song which has a space voyage that went wrong. They try and rescue him. The performer has different songs that start in 1969 and span into 1990’s all dealing with this mythical astronaut played by a British Man who kinda’ Fell to the Earth once. This song came out 5 days before the Apollo 11 mission. 13-May-2013 an actual Canadian Astronaut song this song on his goodbye to the ISS. Some of you have stumbled on the song and the performer but you move right on to another deep topic which I think is chasing a wild goose kinda’… just my opinion.